Ideally situated on O Connell Street in the heart of Dublin’s City Centre, this is an excellent location either for shopping, exploring or business. Many of Dublin’s famous tourist’s attractions and shopping areas are all within walking distance. Lynams Hotel is a small traditional style hotel offering great friendliness and attention to detail. 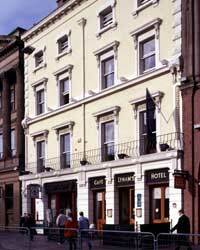 The excellent location, warmth of the staff and the famous Irish hospitality will make your stay a memorable one. The guest can choose from a single, double, twin, double-single, triple or family room. All the ensuite rooms are very cosy and nicely furnished and contain all necessary facilities for convenience and comfort. Facilities include telephone, televisions, tea and coffee making facilities, ISDN direct dial and dataport, room service, laundry service and wake up calls. Lynam's Cafe-Bar Restaurant is located on the ground floor, and is known for great service and hospitality. It is a warm and friendly restaurant and is popular with locals and visitors alike. The hotel is also surrounded by fine pubs, cafes, and restaurants all offering a wide variety of cuisine ensuring that all tastes and appetites are catered for. Located on O'Connell Street, one of the most beautiful and widest streets in Europe. Most of the great shopping and tourists attractions are close at hand. Enjoy the fantastic shopping facilities to be found on Henry Street and Grafton Street. Or step to Temple Bar and enjoy the pubs, cafes, restaurants, the little shops, and the hottest night life in town. Or if you are a history fan check out Dail Eireann, The Natural History Museum and Dublin Castle and don’t forget to pop in to The National Gallery and take a stroll down Stephens Green.